Earlier, his alter-ego Panti made an appearance at the St Pat’s For All parade in Queens. RORY O’NEILL, whose alter-ego is drag queen Panti, was honoured at a ceremony in New York today. Panti tweeted – with tongue firmly in cheek – that the event was “no biggie”, but O’Neill was clearly delighted with the honour. The ceremony took place after Panti made an appearance at the inclusive St Pat’s For All parade in Queens, a celebration of St Patrick’s Day that’s open to all members of the community in NYC. 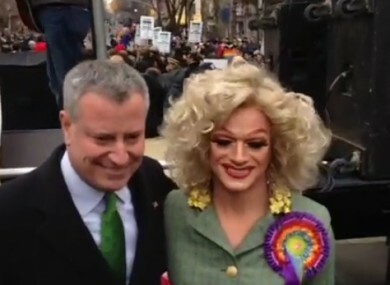 Among those attending was New York Mayor Bill de Blasio, who declined to attend the NYC Saint Patrick’s Day parade on 17 March last year due to a ban on LGBT groups. The New York Times reported on 4 February that de Blasio won’t be attending this year because of the continuing ban. Also attending the St Pat’s For All parade were the members of the New York City council who are boycotting the larger St Patrick’s Day parade. Rory O’Neill and Panti have become worldwide names after Panti made a stirring speech on the Abbey stage during the ‘noble call’ in the show The Risen People. This followed controversy over O’Neill’s comments about homophobia in Ireland while on RTÉ’s the Saturday Night Show. The comments led to a payout by RTÉ to members of the Iona Institute. In turn, this led to a larger debate about homophobia in Ireland, with members of the Dáil, TDs John Lyons and Jerry Buttimer speaking to the house about their own experiences of homophobic abuse. Email “"No biggie": Rory O'Neill honoured at New York ceremony”. Feedback on “"No biggie": Rory O'Neill honoured at New York ceremony”.